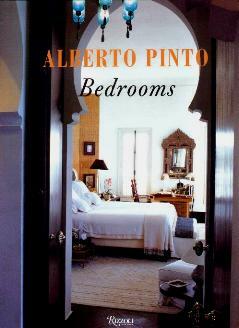 I adore the Rizzoli books, and this one on bedrooms, is just as exquisite as many of their publications. Leading international interior designer Alberto Pinto, has put together an abundance of bedroom designs in this beautifully illustrated book, and he not only concentrates on master bedrooms, which are nice, there are bathrooms, gym rooms, closets, and more. He feels that even a guestroom, even though a temporary place to stay, should offer amenities like "a hair dryer, a manicure set, several fragrances of soap, bath salts and oils, sponges, and a pumice stone". Yeah, right! This sounds more like a really upmarket B&B - I wouldn't want to use a manicure set, sponges, or a pumice stone that someone else has used! Now, these bedrooms are not found in your everyday house - they're more suited to country estates or very plush city apartments/houses. His choice of materials is very upmarket and include English armchairs, Louis XVI marquetry commode, Venetian glass, marble flooring, a giant gingko leaf chair by Claude Lalanne, and many more such obscure and no doubt pricey accessories. One thing I really did like was the Italian mirror-clad cabinet on page 118. It's obvious that Pinto has taste and I think he'd appeal to European nobility and royalty with these designs. For me, there were too many florals, wall paper, ostentation, and to be quite honest, some rooms looked as though they could be a room in a bordello. Sadly, I don't think I'd feel comfortable in any of these rooms, even the plainer ones. If I had to choose one, it would be the elegant simplicity on page 178. Conclusion - Beautiful book but not a practical tool for the layman. Interesting to see how "the other half" live though.